We moved to Georgia at the tail end of the school year. I was so thankful to my kids’ teachers for welcoming them into their classrooms with open arms and hearts. They truly made the transition so smooth. And hey, they only had to put up with my kids for 8 weeks! So before school ended, we whipped them up a little homemade appreciation gift of strawberry freezer jam and anise biscotti. The kids helped! I know the teachers probably would have appreciated a gift card even more, but I’m trying to teach my kids how special it is to give the gift of your time. In the age of I want it now, it is special when you take the time to make something…it says that YOU mattered enough for me to spend time on you. And for the record, my kids’ teachers – past, present and future – matter so much. I can never repay them for the impact they have on these young lives. Confession: sometimes I like the presentation of the gift more than the gift itself! I’m a big fan of brown paper bags for wrapping a gift because you can jazz them up in so many different ways. 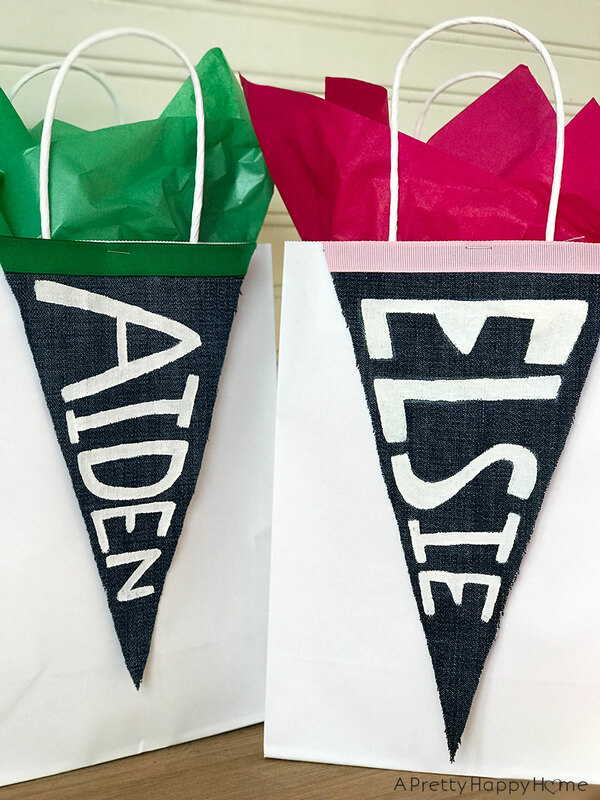 To personalize these bags, I cut slits through the bag with my craft knife and threaded ribbon through each slit, all the way around the bag and then tied it off. At the last minute, I decided to make little labels for each baked good. I used Adobe Indesign to make the layout and then glued it onto card stock. The freezer jam is sort of tricky to gift because you don’t want it to thaw! I usually wrap the jam container in some sort of cellophane bag to prevent condensation from getting the surrounding wrapping paper wet. So, there you have it! The 2013-14 school year is in the bag! I now have a kid going into Pre-K and a kid going into 2nd grade. I’m going to blink and they will be graduating from high school! Here are some other posts you might like! Truly. Probably.